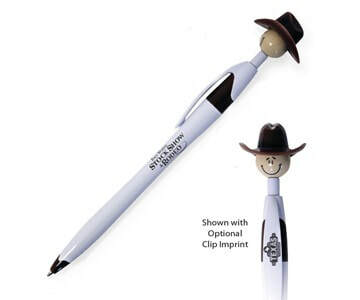 These customized cowboy pens are a great, low cost giveaway for corporate outings with a western theme, country music events, and bull riding competitions. Order some customized cowboy pens today by scrolling down and clicking below, or by calling 401-451-1874. We are always happy to help with artwork for your custom logo order. These customized cowboy pens are printed with your one color logo, and as you can see, the pen itself has a brown trim to complement the cowboy's brown hat. These pens will arrive at your door with black ink, as it is currently the only option for this specific pen right now. - The price you see is all inclusive, no additional shipping or setup fees!